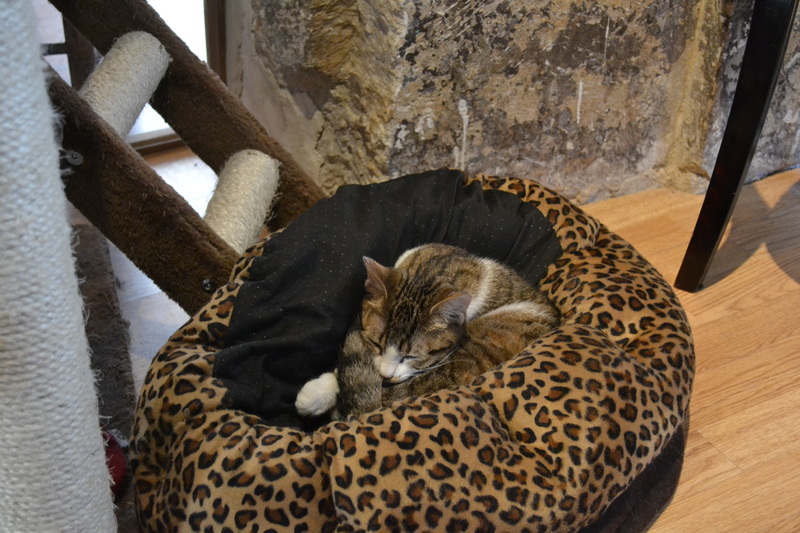 Cat cafés seem to be the trend du jour, and when I heard that a new feline-themed venue had opened in the Marais district in Paris, I couldn’t satiate my curiosity on my recent trip to the French capital. Situated in a blink-and-you’ll-miss-it building on a quiet street (Rue Michel Le Comte) close to the bustling Rue de Bretagne, I entered and was greeted by the receptionist who then went on to tell me the do’s and don’ts of the establishment. I was pleased to hear that the cats’ safe café environment is taken very seriously and we were told not to disturb their slumber with flash photography or feed them (as tempting as it may seem). We were also told to sanitise our hands before entering. 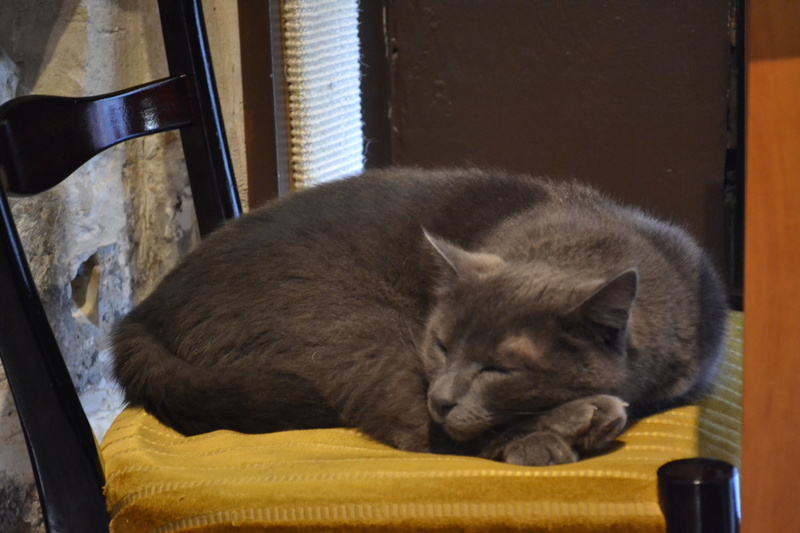 Le Café des Chats itself is very rustic and clearly a home-grown initiative. The food is homemade and hearty and a dozen cats roam free, mostly sleeping on chairs or cushions. Far from being a tourist-magnet, the café is determined to provide a great life for their feline friends. Most have been given a second chance and were rescued after being abandoned or born in the street. A handy laminated sheet lists all the cats, their nicknames and personalities alongside a photo, so you can get to know the cats a little bit more. As I sipped my coffee, a curious cat hopped up onto my seat and made himself comfortable on my leather jacket (I didn’t have the heart to move him until we left; he looked very happy indeed). 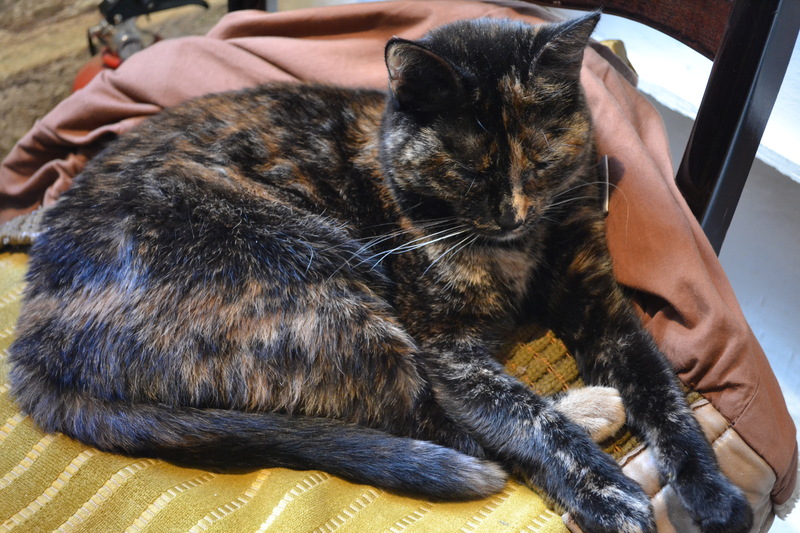 It was certainly a quirky café experience and ideal for cat-lovers and as a treat for families with youngsters who want to spend some quality time with some furry friends. A little more info can be found here.